Education Qualification :Graduate in any discipline or B.Sc with three years experience or 12th Passed, preferably one year experience. 1. Upto 62 years for retired govt. employees. 2.30 years (Relaxable in age as per GoI rules). 3.30 years (Relaxable in age as per GoI rules). 1. Rs. 15,000/- (fixed) per month. 2. Rs. 13,500/- (fixed) per month. 3. Rs. 7,200/- (fixed) per month. Completed applications strictly in the "FORMAT OF APPLICATION" available in institute’s website http://ibsd.gov.in/ and a recent passport size photograph affixed in the application form along with attested copies of all mark sheets, caste/tribe certificate, experience certificates, etc. should reach to the Senior Administrative Officer, Institute of Bioresources and Sustainable Development, Takyelpat Institutional Area, Imphal, Manipur - 795001, on or before 07.06.2013.The name of the post applied should be clearly written in BOLD LETTER on the front of the envelope. Education Qualification :Candidates should have passed Mtech /B.Tech + 3 yrs experience with a good academic background in Mechanical/Aerospace Engineering/Applied Mathematics with specialization in Fluid Mechanics/CFD/Turbomachinery/Thermal Science. Ph.D preferred. And for Project Associate Mtech /B.Tech + 1 year experience in Mechanical/Aerospace Engineering with specialization in Fluid Mechanics/CFD/Turbomachinery/Thermal Science. B. Tech with an excellent academic background. Interested candidates may send their resume to the following address or email at subrata.sarkar1@gmail.com before 17th June, 2013. 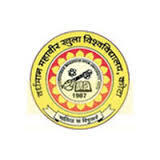 Vardhman Mahavir Open University has declared the result of RKCL Examination held on 12th May 2013. The result is available by Roll No. and By DOB. Good News for candidates who are searching for their career in Electricity Distribution Company. 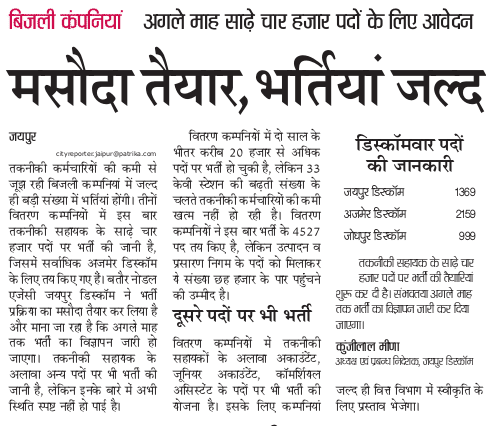 All 3 major DISCOM company of Rajasthan is planning to recruit 4500 (Four Thousand Five Hundred) post of Technical Assistant in which ajmer discom will appoint more than others. It is expected that recruitment process will be finalized in next month. There will be other posts will also be required which details are not cleared yet. 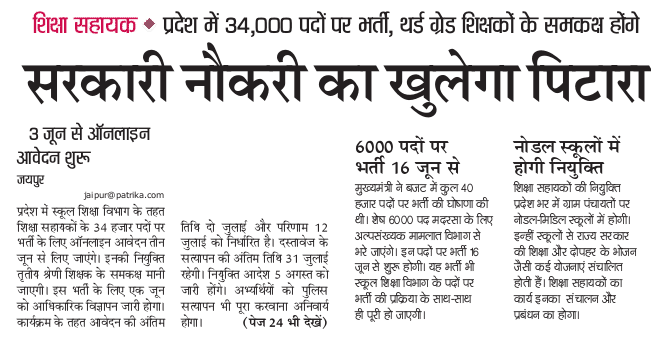 NEWS published in Rajasthan Patrika on 30/05/2013 which image is mentioned here fyi. A Good news for candidates who are waiting for Teacher's post in Govt. of Rajasthan. Govt. has decided to recruit 34,000 (Thirty Four Thousand) posts for Education Assistant who will be equivalent to 3rd grade teacher. Application will be started on 3rd of June 2013. Appointment Order will be released on 5th August 2013. News published in Rajasthan Patrika on 30th May 2013 is attached here fyi. Education Qualification : ITI/Diploma with an additional certificate of competency for Ist Class Boiler attendant as stipulated by Dept of Factories & Boilers, Govt of Kerala.And BSc (Physics/ Chemistry/ Maths) Minimum 50% marks for the qualifying examination required for general candidates. For SC/ST candidates, mark for qualifying examination is relaxed by 5%. Last Date: Last Date for receipt of application by post is 12.06.2013. Education Qualification : Candidates should have passed Graduate in any discipline (minimum three years duration) from a recognised University with ability to speak English and preference will be given to candidates conversant with local language and basic computer operation. Age Limit: 28 to 33 years of age maximum . Selection Procedure: Selection will be based on Group Discussion and Personal Interview. Application Fees: Application Fee of Rs.300/- (Rupees Three Hundred only) by means of an A/c Payee Demand Draft in favour of “Air India Air Transport Services Ltd.” Payable at Mumbai, which is NON REFUNDABLE. Period of Contract: Fixed Term Contract for a period of three years. 1. A recent (not more than 3 months old) coloured passport size photograph 4.5 cm (H) x 3.5 cm (W) of the full face (front view) should be pasted neatly in the space provided in the application form and carry twelve same photographs on matt finish paper with white background at the time of walk-in. 2. Educational Qualification (i.e. SSC, HSC, 1st Year, 2nd Year and 3rd Year Graduation Marksheets along with Passing certificate compulsory). 3. Date of birth proof (SSC Passing Certificate). 5. Caste Certificate in original in the prescribed central government format alongwith photo copy duly attested in case of SC/ST/OBC Candidate. DISCOM has invited double students for document verification for 807 posts. The program for document verification will be declared in one week as per Main working officer of Jaipur DISCOM. Duliajan, Dist. – Dibrugarh, Assam. Selection Procedure: Selection will be based on Personal Interview, Written test and Group Discussion. Interested candidates can apply and may send their application below address.The completed application form along with the relevant documents should be sent to the below address though ordinary post in an envelope super scribed with the Post Code applied for latest by 06.07.2013. Applications received without the post code super scribed in the envelope will be summarily rejected. 13 th Floor, New Multistoreyed Building, K.E.M. Hospital Campus, Parel, Mumbai - 400 012. Educational Qualification: Candidates should possess three years Bachelor Degree in Life Sciences / Microbiology / Biochemistry/ Chemistry/ Biotechnology/ Genetics from a Recognized University with one year Diploma in Medical Lab.Technology (DMLT) for Post No.1, HSC (10+2) with science subject from recognized Board with two years Diploma in DMLT Govt. Recognized Organization for post No.2, M.Sc. 1st class in Life Science / Microbiology / Genetics, Molecular Biology / Biotechnology / Biochemistry / Chemistry for Post No.3, HSC (10+2) with 2 years experience in Data Entry for Post No.4, M.D. with 3 years research experience in relevant field for Post No.5. Age Limit: Candidates upper age limit should not exceed 30 years for Post No.1, 28 years for Post No.2, 3 & 4 and 40 years for Post No.5 as on 01-04-2013. 4th June, 2013, 12.00 P.M.
5th June, 2013, 9.00 A.M.
6 th June, 2013, 9.30 A.M.
3. Rs. 18000/- + HRA as per rules. Educational Qualifications: Candidates must possess Graduation in any discipline from recognized University with proficiency in local language. Age Limit: Candidates age must be above 18 years and below 28 years for Officers Scale-I post and between 18 to 28 years for Office Asst post as on 01-06-2012. IBPS Score Card Details: Candidates must possess valid IBPS Score Card in CWE conducted by IBPS for RRB’s in September 2012 and should have minimum weighted score as 89 & above marks for SC/ ST/ SC-PWD/ST-PWD/ SC-EXS/ ST-EXS and 95 & above for OBC/ GEN/ OBC-PWD/GEN-PWD/ OBC-EXS/GEN-EXS for Office Asst posts and 97 & above for SC/ ST/ SC-PWD/ST-PWD/ SC-EXS/ ST-EXS and 103 & above for OBC/ GEN/ OBC-PWD/GEN-PWD/ OBC-EXS/GEN-EXS for Office Scale I post. Application Fee: Unreserved Candidates must pay Rs.100/- and SC/ST/PWD Candidates must pay Rs.20/- as Application Fee in the form of Challan through CBS at any of the branches of Allahabad Bank or Allahabad UP Gramin Bank in CBS Account No. 50153718140 of Allahabad Bank & CBS Account No-10860200000240 of Allahabad UP Gramin Bank for Officer Scale-I and in CBS AccountNo-50153718071 of Allahabad Bank & CBS Account No -10860200000259 of Allahabad UP Gramin Bank for Office Assistant post. How to Apply: Candidates have to apply online through the Bank’s Website www.allahabadgrameenabank.com from 30-05-2013 to 14-06-2013. 1. Candidates have to ensure that the E-Mail ID (as specified in the online Application form while applying for RRB’s – Common Written Exam CWE is conducted in September 2012) is kept active during the currency of a recruitment project. 2. First Candidates have to log on to www.allahabadgrammenbank.com and click on the “Recruitment/ Careers”. 3. Take Print out of Challan and make the payment. 4. Candidates have to obtain the Counter foil Copy of the fee payment Challan with Branch Name, Code No, Date of deposit & Amount. 5. Revisit the Bank’s Website and Fill the application form carefully and submit it. 6. Take a print out of the completed online application. 7. The applicant should sign and affix his/ her recent photograph on such printout of application and keep the same ready for submission if selected for Interview along with copies of required documents. Education Qualification : M.A. with at least 55% marks, MBBS Degree from a recognized University. Application Fees: For Group‐A posts: Rs.500/‐ (non‐refundable); For remaining categories of posts lower than Group‐A posts: Rs.300/‐ (non‐refundable) for General/OBC candidates; No fee is the said payable in respect of SC/ST/PH candidates, if the post is so reserved for category. Application fee shall be payable in the form of Bank drawn in favour of “Finance Officer, JNU” payable at New Delhi. The eligible and interested persons are required to apply on‐line in the format available in the University website www.jnu.ac.in. Applications, except online, will not be accepted. Applicants are also required to submit the hard copy, signed copy of the online application along with the prescribed application fee, one passport size photograph and attested copies of the certificates of educational qualifications, date of birth, experience, caste, PH certificate, etc. to Dy. Registrar (Admn. ), Room No. 304, Administrative Block, Jawaharlal Nehru University, New Delhi110067 within 30 days of the publication of this advertisement in the Employment ews, which will be notified in the JNU web‐site. 01 year Post Qualification Executive Experience in line (including experience as ET/MT) in a PSU/ Large Private Sector Organization. Preference will be given to candidates having in line executive experience in Oil & Gas/ Petrochemical Industry. OR Graduation (B.A) with Honours in Economics with minimum 60% Marks and Two years MBA with specialization in Finance with minimum 65% Marks. with specialization in Finance with minimum 65% Marks. OR Graduation (B.A/B.Sc.) with Honours in Statistics with minimum 60% Marks and Two years MBA with specialization in Finance with minimum 65% Marks. How To Apply : CANDIDATES WILL BE REQUIRED TO APPLY ONLINE THROUGH GAIL WEBSITE: www.gailonline.com. No other means/ mode of application shall be accepted. Website will be opened from 1000 hrs on 15/05/2013 to 2400 hrs on 03/06/2013. The application and other details as mentioned above must reach the above address by 17/06/2013. Educational Qualification: Candidates should possess Degree in Computer Science & Engineering/ Electronics Engineering or have passed MCA for post 1, 10+2 with Hindi & English typing & knowledge of computer for post 2, Primary level for post 3. Age Limit: Candidates age limit should be between 18 to 25 years as on 01-07-2013. Application Fee: Candidates has to pay the application fee of Rs.200/-in the form of demand draft drawn in favour of Chief Executive Officer, Cantonment Board Dagshai payable at Punjab National Bank Dagshai Cantt. Selection Process: Candidates will be selected based on the performance in written test followed by interview, Medical fitness for post 1 & 2, Physical test, skill test and interview for post 3. How to Apply: Eligible candidates can send their applications in the prescribed format along with attested copies of entire certificates in support with age, educational qualification, experience etc and three attested passport size color photographs and two self addressed envelope with postal stamp of Rs.22/- each and bank DD and super scribe the name of the post applied for on the envelope and send to The Chief Executive Officer, Cantonment Board Dagshai Tehsil and Distt Solan (HP) on or before 07-06-2013. Educational Qualifications: Candidates who passed put ITI/NCVT along with basic and advance module for 06 months apprenticeship training in the relevant Trade. Last Date: Last date of submission application within 21 days after publication of advertisement. How to Apply: Eligible candidates can apply in a prescribed format as given in the notification, affix recent passport size photograph and attest signature, fill it with all mandatory details and enclose photocopy of Educational/ Technical Mark sheets/ Certificates and send them to Dy. Manager (HR), Scooters India Limited, Sarojini Nagar PO, Lucknow -226008 by Registered Post within 21 days from the date of Advt published. The application form can be downloaded from the official website of SIL. 1 Please make sure to complete all fields, without leaving any fields blank. Incomplete fields may result in rejection. 2 Make sure to clearly mention the name of the position applied for. 3 Application not sent in prescribed format will not be considered. 4 Last date of receipt of application form through registered post will be 21st day from the date of publication (23.05.2013) of advertisement on SIL website. 5 Candidates passed out the desired examination prior to year 2010, need not apply. 6 Stipend shall be as per Apprentices Act, which is at present 1700/- (Rupees One Thousand Seven Hundred only) per month, all inclusive. Post : Project Manager, Dy. Manager (Fin. ), Dy. Manager (Material), Dy. Manager (Electrical), PA Tech to Project Mgr., Supervisor (Civil), Supervisor (Electrical), Supervisor (Mechanical), Accountant, PA to Plant In charge, Asst. Engineering. so as to reach on are before 14.06.2013. Applications not in a prescribed format or not signed by the candidate of incomplete in any respect will not be entertained and will be rejected in only the short listed candidates shall be called for the interview. The Candidates should submit the details in following application format only otherwise his /her application will not be applicable. and one set photocopy of the same and two passport size photographs. [Total Emoluments including HRA Rs.14,720/-]. Ex-Servicemen / Ex-Central Armed Police Force personnel with Matriculation (10th Std.) or equivalent. Job description : Selected persons will be deployed for providing security cover as Security Guard / Chowkidar to the Institute properties. a. Eligible candidates are required to apply in the prescribed proforma to the Administrative Officer. MBBS with 55% marks with 5 years of relevant experience OR MBBS and MD (Medicine) or equivalent with three years of relevant experience. The candidate should be in possession of permanent valid registration Number. The MBBS/MD degree should be from any institution recognized by MCI. The experience should compulsorily include one (1) year rotating Residential housemanship (internship). MD candidates, if available, will be preferred to the MBBS candidate. b. The application, duly accompanied by attested copies of the certificates, mark sheets, testimonials in support of age, education qualifications, experience, re‐prints of publications and caste certificate, if applicable, along with one recent passport size self‐signed photograph affixed, together with Demand Draft (if applicable) should be sent in an envelope superscribed "APPLICATION FOR THE POST OF ____________” by post so as to reach the following address by 03.06.2013.
a. Demand Draft of Rs. 100/‐ as application fee, where applicable. c. Self Attested photocopy of certificate proving Date of Birth. d. Self Attested photocopies of educational qualifications (Certificates & Marks Sheets). f. Self Attested photocopies of experience certificates, wherever required. g. Self Attested photocopy of valid Registration Certificate issued by any approved Medical Council. Research Associate : Ph.D. with minimum 1 publication in SCI journal with I.F. Senior Project Fellow : JRF + 2 years research experience + 1 publication in SCI journal with I.F. The interested candidates should send the application in the prescribed format only by e-mail (marine@csmcri.org) latest by 6th June, 2013. The shortlisted candidates will be informed by e-mail to attend the interview to be held at CSMCRI, Bhavnagar on 17th June, 2013. The selected / suitable candidates will be allowed for Ph.D. enrollment; JRFs will have the possibilities of Ph.D. enrollment in the prestigious AcSIR of CSIR. Technical Officer: M.Sc. in Horticulture with specialisation in floriculture and landscaping with ≥60% marks with 9 years or more experience in Floriculture and landscaping/ornamental gardening. Ph.D Physics (Doctoral work should be related to extensive usage of X-rays at a high energy synchrotron beam line) with MSc Physics with ≥ 60% marks from a recognized university. 1. (a) Applications will be accepted on-line only. (c) The candidates may download a copy of the application and admit card and submit the same along with the attested copies of all relevant documents in support of date of birth, educational qualification, caste, experience only at the time of interview. Candidates who report for the interview without any of the supporting documents will not be allowed to appear before the interview committee. (d) The facility of online application will be opened on 18/05/2013 and closed on 10/06/2013. Application Fee : A non-refundable application processing fee of `250/- (Rupees Two hundred fifty only) is chargeable from applicants. Candidates belonging to SC/ST, dependents of defence service personnel killed in action, persons with physical disability and women candidates are exempted from payment of this fee. Persons with physical disability should produce necessary certificate from Govt. Hospital/Medical Board in support of their claim. Note : Only four southern state candidates (ie Tamil Nadu, Andhra Pradash, Karnataka, Kerala) and puducherry can apply for this post. Other state candidates need not apply. Candidates should know local language of the above states. (B) Pass Certificate of Hindi Short hand from Chhatisgarh or Madhyapradesh board. (C) Candidate should have knowledge of MS-Word and Internet with Diploma in computer Application (DCA) and 5000 key depression per hour speed. If any candidate have higher education certificate then required will not get any extra marks. Application should be filled in application format given with this advertisement on or before 25th June 2013 to the District Office of session court, Kabirdham (Kawardha), Chhatisgarh. If candidate wants to apply for stenographer and assistant grade 3rd both then he has to fill separate form for both posts. Selection list will be prepared on the basis of marks obtained in practical and interview. In the case of similar numbers birth date will be base of selection. Selected candidate probation period will be 2 years. Education Qualification : 12th Pass under the 10+2 pattern or equivalent examination from a recognized Central/State Board/Institution or Master’s Degree or Graduate with one year experience. Walk In Interview: 6th June, 2013 at 10.00 A.M. Interested candidates can apply and bring their updated biodata, original certificates in support of their claim in age, educational qualifications, experience etc. 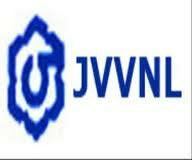 at the time of interview on 6th June, 2013 at 10.00 A.M. Room No.2, 1st Floor Janaki Ammal Khand, DESM, NCERT. 1. Candidates must scan their photo and signature and make the payment before starting the application procedure. 2. Log on to www.upsconline.nic.in to start the application process. 3. Select on ‘Online Application for Various Examinations of UPSC’ link and select the Combined Defence Services Examination II link. 4. Select the Part-I Registration link which consists of personal details, fill all details carefully. 6. This will provide you with Registration ID, retain it for further use. (1) Post Graduate degree in any discipline from a recognized University. 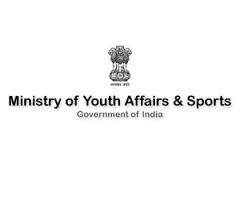 i) At least three years experience in youth development activities / rural development / community development / other social sectors including voluntary work in a recognized organization in a responsible position. Note : Applicants who had been declared successful at the UPSC Civil Services Main Examination, 2011/12 and appeared for interview but were not finally selected for any appointment in any of the Services under the Civil Services Examination. a) Candidates who are eligible may send their application form, complete in all respect in an envelope Superscripted ”Special Drive for Recruitment of DYC, NYKS” and must reach at the following address: Joint Director (GA), Nehru Yuva Kendra SangathanCore-4, 2nd Floor, Cope Minar, Twin Tower Complex, Laxmi Nagar, Delhi-92 either by hand or by post or by courier/e-mail to dycnyks@gmail.com in the prescribed proforma (Annex-II). Education Qualification : B.Sc, Matriculation , Master’s degree in Chemistry/Forensic Science, Graduation and M.Sc. Degree in Electronics or Electrical Communication. Age Limit: Candidates’ age limit is 18-25 years for S.No 1, 2, 7, 8 Posts; not more than 30 years for S.No 3, 4, 5, 6, 9 Posts as on last date of receipt of application. Application Fees: Candidates need to pay the fee of Rs.50/- in the form of Central Recruitment Fee Stamps (CRFS) which are available in all Post Offices. SC/ ST, OH/ HH, Female and eligible EX-Serviceman candidates are exempted from the fees. Selection Procedure: Selection will be based on Written test and personal interview. Under Any Circumstances. The Commission will not be responsible for postal delay. 2. One recent passport size photograph, duly signed and pasted (NOT STAPLED) in the space provided in Application Form. Two copies of the same photo should be retained by the candidate for pasting on the Attendance Sheet/Bio-data form. 4. Attested copies of certificates in support of claim of SC/ST/OBC/PH/Ex-S.
6. Others who claim age relaxation should submit certificates in support of their claim.